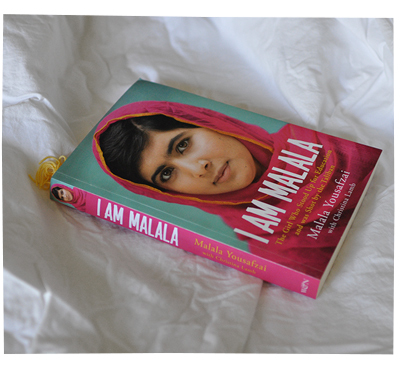 Earlier this year, I read the book I am Malala. I was keen to find out more about Malala’s story, as I only knew of what I heard from the news; that she was a 16 year old Pakistani activist fighting for the rights of girls to have an education; that she had been shot in the head by the Taliban; that she won the Nobel Peace Prize in October 2014. Honestly, I had wanted to read the book since it was released in 2013. But I felt a bit guilty and morbid that my interest was piqued by such a horrifying act (a young girl being shot in the head!). However on the other hand, I am fully aware that she is using her own story of survival and her new found fame to drive her very worthy cause and take it to a wider audience – to people on the other side of the world, like me. So it was with that internal mix up of guilt, curiosity, and a desire to support her … that I went out and bought her book. The book is a bit chopped up. There is a bit about the history of Pakistan and regional politics, which I found really fascinating and informative. Then there are parts of the book with a more personal tone, where Malala speaks of her hometown in Swat Valley, her upbringing, her family, the everyday dramas they faced, the events leading up to the Tabilan invasion, the shooting, and her life after the shooting. I really enjoyed reading about all this too. It is written in a very easy, simple, straight-forward style. Overall it is interesting, inspiring and gave me lots of think about. These were the main ideas that struck me the most. I understand poverty at an intellectual level, but I can’t handle it on an emotional level. The more I tried to absorb the kind of poverty Malala talked about in her book, the more I was rendered with a heart-gripping helplessness, sense of unworthiness and sadness… that made me consider selling all my possessions so that I wouldn’t feel the guilt of my own Western richness. I seriously couldn’t handle it. And I have no clue about what to do about it in a way that would even make a difference. I loved that she loved to learn. That was very inspiring to read. I loved that education was so precious to her; Chemistry, algebra, geography, all of it. I wanted to know… what kind of teenager feels so passionate and so driven, that she endangers herself and speaks up against the status quo of her country and government?? Well, her story points to her father. Her father was passionate about education and speaking out about human rights. Her father was a teacher. He built schools – many schools! He loved education. He loved helping people. He loved his country. He went to meetings with other community leaders in the middle of the night, to discuss politics and education and how to create a better future for his country. So it was very heartening to see that she had followed that path too and has now made it her own. As a parent, I read most of this book with a bursting pride in my heart. What an amazing young lady she is. I am so proud of her! After Malala was shot, she was brought to the UK for medical treatment. Weeks later, the rest of her family were also moved to the UK. Now they have a new home, they live in a comfortable little town house, with running water, supermarkets, education, safety, security, freedom. They pretty much have everything they could need or want. But they are alone; away from the rest of their family and their friends, away from a world that they know, and are comfortable. I felt their gratefulness for their new home, but I also felt their disconnection, loss, emptiness and sadness from being away from their old home. It gave me a bit of insight as to how refugees in a new country might feel. And I am so deeply grateful that I live in a such a comfortable and prosperous place that I can call home. Having been educated and lived most of my life in a Western society, I see nothing but inspiration and empowerment in Malala’s story. But in Pakistan, I have heard that there are critics who speak out against her story and her “Western” ideals. They point out the hypocrisy and narrow-mindedness of her global supporters, who look past the bigger issues of conflict, history, politics, economics and war involving the West in the region. I’m no expert on the topic, but I do know that it’s extremely complicated… and that sometimes Western ideas are not always the solution. The cover of the book is bright and modern. The publishers chose a wonderful photo of Malala. Her face and expression really said: Peace, confidence, looking past her troubles towards something greater than her own. The book was a fascinating and easy read – I recommend it for everyone!